I don't know if this is new in eMusic or if I only just noticed it, but it's kind of cool. It generates recommendations of artists you might like based on what you've already bought, which is nothing new. But the visual display of it is pretty slick. 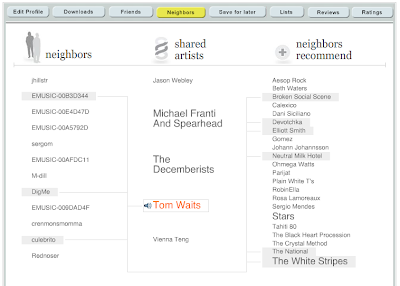 You can see which recommendations come from which other users via which artists, and you can watch the connections change just while you mouse over the different names in all three columns. Plus, of course, you can play samples right there. Nice. The problem here is that I don't really have a reason to care much about things eMusic is recommending based on just a couple months of purchases. What I want is this UI on my Last.fm recommendations, which is based on 3 years of what I've actually listened to. The Last.fm radio is cool and everything, but it would be fun to have this alternate way to browse recommendations more deliberately. Though with so many more recommendations, this design would probably get unwieldy, so you'd have to work out some way to just examine specific parts of the network at a time. E.g. limit it to friends, or neighbors, or tags, or using the obscure/popular slider. I just finished This Is Your Brain On Music, by Daniel J. Levitin. If you're at all interested in music and/or brains it's a fascinating read. I found a lot of concepts that I was familiar with from my cog. psy. classes in college, but it was fun seeing them applied so directly to our perception and experience of music. The book actually made me want to just sit down and really listen to music more than anything else, rather than just having it playing in the background like I usually do. But it also made me want to get back on track again with things like playing, composing, and developing my ear. Particularly interesting to me was the information about perfect pitch. A number of studies have shown evidence that many people, even non-musicians, are able to store absolute pitch information in memory. E.g. they could be trained to recognize or sing back an assigned note that they learned. In other cases, when asked to sing a favorite popular song, they would do so in the right key without any prompting (or even awareness that they were doing so). My guess is that if we taught babies to recognize notes the way we teach them to recognize colors, a great many more people would have perfect pitch. It seems to be built into the brain, but most people just don't know how to use it or develop it. Granted, the people who seem to have it "automatically" make it seem inaccessible to the rest of us, but I think that's just a natural misinterpretation of ordinary person-to-person variability. Another interesting concept regards what it takes to become an "expert" level musician. It seems that amount of practice time really is the biggest factor in becoming really good at something, even more so than perceived talent. Ten thousand hours is the usual amount of time you have to put in to really reach that top tier of world-class experts. And that same number seems to apply not only to music but to everything else that has been studied in this context: playing chess, figure skating, fiction writing, and more. Unfortunately, 10,000 hours is about 3 hours a day for 10 years. Sigh. But I guess that's why we're not all the best musicians in the world. I finally got myself an ice cream maker this weekend, which I'd been meaning to do for a while now. Yes, I know summer is mostly over, but it was still so crazy hot this weekend I figured it was better late than never. And I'm happy to eat ice cream year 'round anyway. So far I've made two flavors, both quite yummily successful. First was cinnamon-cardamom, from a recipe in one of the Moosewood cookbooks. (Thanks, Cass!) Second was nectarine, which I did with just a basic strawberry recipe and the obvious substitution. Not sure what's coming up next. A couple things I've been thinking of for a while are lemon-rose (inspiration from a rose garden in Stockholm) and red tea (since I know there's green tea ice cream, but I like red tea better). I'm also wondering if there's a way to make a spicy chocolate ice cream. Would that work as well as spicy hot cocoa does? I'm having trouble imagining a spicy cold thing, but who knows. I'm more than open to other suggestions, though, so leave a comment with your ideas!